Se efter de originale Dam trolde. Gjøltrolde, Lykketrolde,Good luck trolls, Dam Things, Troll Family and Dam Things Aps Look for the original Dam trolls. A lot of water has flown through the Limfjorden since the fisherman's son and creator af Trolls, Thomas Dam, made his first Troll - in his own image - out of a piece of wood. At that time Thomas Dam's family was very poor and the things that Thomas Dam carved in wood were the family's only income. Nobody knew that at on time these little creatures would become world-famous. Before Thomas Dam started carving in wood he had been fisherman, bricklayer and a baker. After making big dolls for fun fairs for a period of time making Trolls that were smaller. At that time the Troll figures were made of natural rubber and were filled with wood shavings. The wigs were sewed together of small pieces of sheep skin. The clothes were sewed on the Troll. Everything was hard work, but sales went well and it made the family's living. Soon the little back building became too small, and the Dam family had to build a factory. The sales grew steadily in the 60's and thousands of Trolls travelled into the big world. As sales increased a more rational way of producing Trolls was necessary. Therefore a new kind of plastic had to be used in order to make the Troll's body on a machine. This material also had the advantage that it lasted longer than the natural rubber. The rest of the production of Trolls is still mostly handmade. This ensures that the quality is the best and that each Troll is something very special. Since the start of Trolls production many people have tried to copy the Trolls. 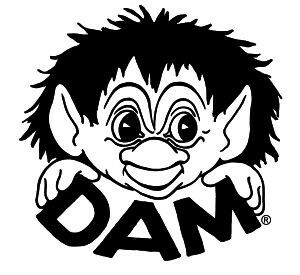 But there is only one original Troll: The Dam Troll from The Troll Company in Gjøl, situated in the northern part of Denmark. In the whole world, there is a lot of troll collectors and in the fall 2009, the American collectors make a Dam troll convention. Dam trolls still exist, the name is Dam Things Aps and still have office in Gjøl in Denmark. Dark. I am now back in the USA , can I send it back to fix it? Join FB group Dam Troll Collectors, where you Can learn abort The Dam Trolls. Se mere om det på FB siden Gjøl Troldemuseum og bliv medlem. Love them-there is a movie Trolls-out in the USA in November. I wrote a book on Amazon UK Trolls.